Almost all of us want our money to grow. Real estate and equity are the two major growth asset classes when you are thinking to invest for long. Which out of the two is an ideal option? Well, the debate is on for long. For some, stock is a better investment avenue and real estate may seem attractive for others. Every investment has its pros and cons. ultimately, investment choices are made basis your financial goals, risk appetite and other priorities of life. Here are some points that you can consider before taking investment decision. Profitability: Real estate is seen as safe bet by Indian investors. People who have invested during 2004-05 and 2010-11 when the property market was booming have earned good profits. 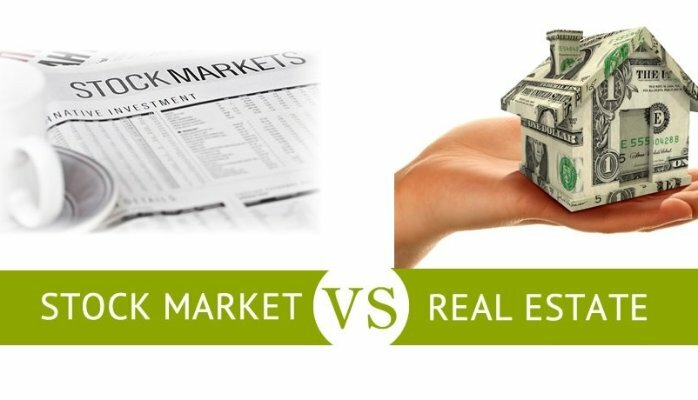 Though the market is having a downfall from last 3-4 years, many people are still under the assumption that real estate pays off impressive returns for long term than stocks which are more volatile. But, data below tells a different story! Equity over the longer run certainly wins over other asset classes. Due to volatility nature, risk adjusted returns are higher for equity. Time: If we look at the history, real estate market has taken longer time for correction when compared to equity market. Market was at peak between 1988-1994. There was heavy downfall after this which took quite lot years to get corrected. Same way, real sector is in its bad phase from past 3-4 years. Stock market recovers quickly when compared to real estate. Timing the market is the major factor in decision making. Lots of research is required in choosing the asset class. Liquidity: Every investment decision has to be made basis your need for liquidity and age at which you are investing. Your equity portfolio can be readjusted easily with the option of diversification. Stocks being traded on a daily basis, transacting and finding a buyer and seller are more convenient. You can sell of your stocks whenever you are in need of immediate cash. It will take less than 2 days for money to hit your account. Unlike stocks, it can take months or years to find a buyer in real estate market. Hence, equity investments are much more liquid when compared to real estate. Amount of Capital: Investing in real estate needs huge amount of capital in hand as you need to put down the 20% of property value out of your pocket during construction which is big barrier for small and medium size investors.In addition, property investment needs additional capital to maintain the real asset that you have invested in due to tenant rotation and many other things. On the other hand, equity shares can be bought by anyone with the minimal amount. There are plenty of good stocks which are inexpensive and additional unit of stocks can be purchased even in the later stage depending on the availability of capital. Trading charges or fund management charges and advisory charges are nothing when you compare it with the high level commission involved in real estate and its maintenance cost. when it comes to size of investment, equity scores over real estate as you need to shell out lacs to buy a piece of land. Regulatory Structure: Real Estate in India is not an organised sector and is considered as safe haven for hoarders of black money. Due to this, there are many disputes in the market like builders delay in delivering the projects on time, overcharging for the facilities and many more. However, recent rupee revamp by Modi government, parliament’s bill to set up Real Estate Regulatory Authority (RERA) by next year August and governments plan to roll out Goods and Services Tax (GST) could make the sector more disciplined over the years. On the other hand, stock market is under the regulatory framework of SEBI (The Securities and Exchange Board of India) which is the best regulatory body in India. SEBIs stringent measures in favour of investor’s interest always give a confidence and keep the market competitive for investors. On a closing note, it’s time for Indian investors to change the mindset as fall in NIFTY Realty index is reflecting a bad phase ahead for real estate market. It’s important to consider the fact that equity market has always outperformed over the longer period of time. However, at the end investment is always a personal decision. Make a wise choice keeping your goal and other facts in mind! I have gone through your text. People go away from equity investment because losses occur very fast and profits take time . You should suggest systems to cap the losses alongwith limits and how these limits economically can be fixed? I want to invest in some of stock s as u opt the best for growth of my fund.& furthermore why udo it for me? What’s ur service cost to me.please clarify.